Reread the warning under my masthead and consider bundling it with this story to those who scoff at such concerns. Then pray that there are those near the highest levels of influence who will be reinvigorated with the holy spirit. That there remain some who still can affect changes in global policies that are not misanthropic and/or Malthusian pessimistic. 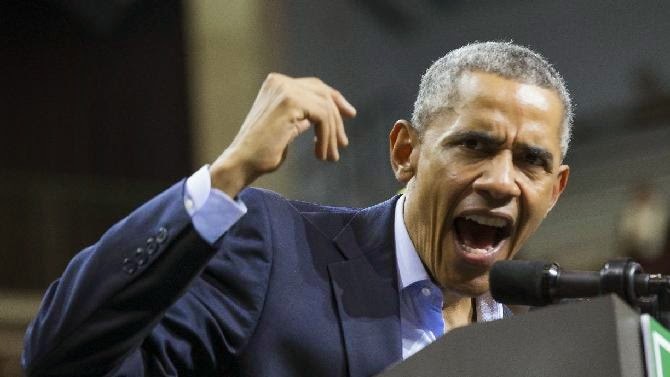 Here's the image of the pissed off community organizer that the SSM hid from America for six years. "CROWD WALKS OUT ON O"
Sure. The SSM wants to tell those it misled all these years that it is him who is the problem and not the deadliness that is their Leftist bent. But those of us who recognize a character who is one (rather than having any) saw something our fellow citizens didn't see. We saw this image before it was published. It represents the soul of this creature from long before the time he became the darling of the SSM. And what the American soul needs most is to understand how this is also the real image for every damned SKUNC in the country. When he has a run in with a principled conservative, this is the image John McCain hides behind his smirk. When she has to answer to a truly God-fearing man, this is image Hillary struggles to hide. Peel away the smiling façade and this is what every Prog in the country looks like when they encounter tax payers who have had enough of Prog rule. Know that SSM is disclosing this image because it thinks we are stupid enough to trust it now that it is willing to show Obola as he really is. Don't buy it for a minute. Let me either inform you or -- in a few instances -- remind you of some relatively recent history. A few years ago, Robert Mugabe, president of Zimbabwe, had even lower approval ratings than this. And yet he won reelection. And Saint Jimmie Carter blessed the election process. And the Western SSM blessed it too. No election fraud worth noting. Would they lie to you? So you believe that such headlines are hopeful? Why? Because it's much better to be hopeful than angry, and that is how manhood in America has been conditioned these last few generations. Generations have been mouthing the last lines of the National Anthem while ignoring the implications of those words. ...the land of the free and [because it is] the home of the brave. Certainly not brave enough to put an end to voter fraud, which is likely the most fatal of all frauds to any republic. In case this is not enough. I received an email yesterday. Allegedly from John Boehner. It was so brazen in its request for money, I momentarily thought it could be from the Democrats employing psi-op counter-measures. Except the GOPe does think so poorly of its conservative grass-roots base that believe they can still get us to send money to them rather than to individual conservative candidates. Now, I'm asking for your help. Our team at the NRCC sent me the spreadsheet of recent supporters and I don't see your name on the list. We need all of our grassroots supporters engaged in these final weeks before Election Day. The Democrats' campaign machine is desperate and it's stepping up attacks - if we don't have the resources to respond we could come up short when votes are counted. First of all, if the GOPe really were interested in garnering votes, they'd be sending out emails for get out the vote (GOTV) efforts. From all reports, as well as from personal experience, this is simply no longer done. But instead, they are begging us for funds. And you know how they'll spend those funds. Largely spent buying adds that will keep the SSM quite well funded and tearing us apart with divisive stories, fictions, and mindless entertainment. And keeping the professional election fund raisers well paid. Secondly, we know from their own words that the GOPe, led by Boehner and McConnell, has proclaimed that they'll not fight Obamacare or anything else that is unconstitutional but well established by now. Too many moneyed interests are making money. In other words, the GOPe are conservative in precisely the negative -- don't-you dare-rock-the-boat-or-else -- sense. I for one want nothing to do with them unless rope is nearby. So if you, like me, are a conservative in the principled, constitutional republic loving sense, then understand how they are playing on your conscience that not funding them is doing not enough. And if you buy that, you've already bought the proverbial Brooklyn Bridge and the GOPe's disregard for your intelligence is indeed well founded. This is our alleged alternative to the radical Progs? G-d help us! Sigh. The Prog murder of our once great republic continues apace. Pray.